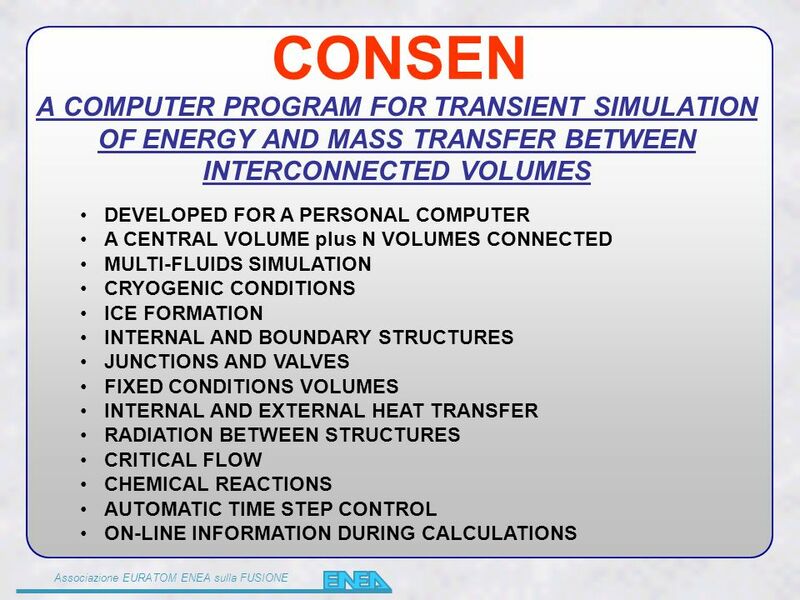 Associazione EURATOM ENEA sulla FUSIONE CONSEN A COMPUTER PROGRAM FOR TRANSIENT SIMULATION OF ENERGY AND MASS TRANSFER BETWEEN INTERCONNECTED VOLUMES DEVELOPED. 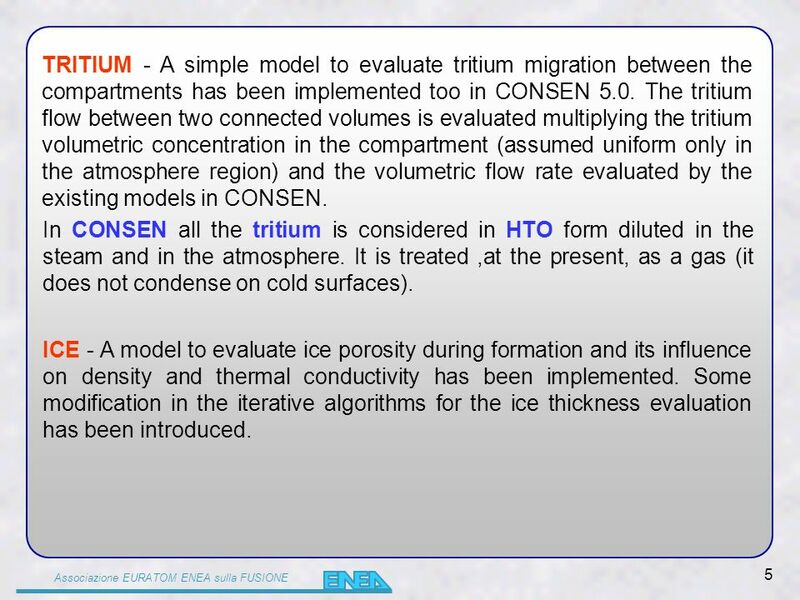 5 Associazione EURATOM ENEA sulla FUSIONE 5 TRITIUM - A simple model to evaluate tritium migration between the compartments has been implemented too in CONSEN 5.0. The tritium flow between two connected volumes is evaluated multiplying the tritium volumetric concentration in the compartment (assumed uniform only in the atmosphere region) and the volumetric flow rate evaluated by the existing models in CONSEN. ICE - A model to evaluate ice porosity during formation and its influence on density and thermal conductivity has been implemented. Some modification in the iterative algorithms for the ice thickness evaluation has been introduced. 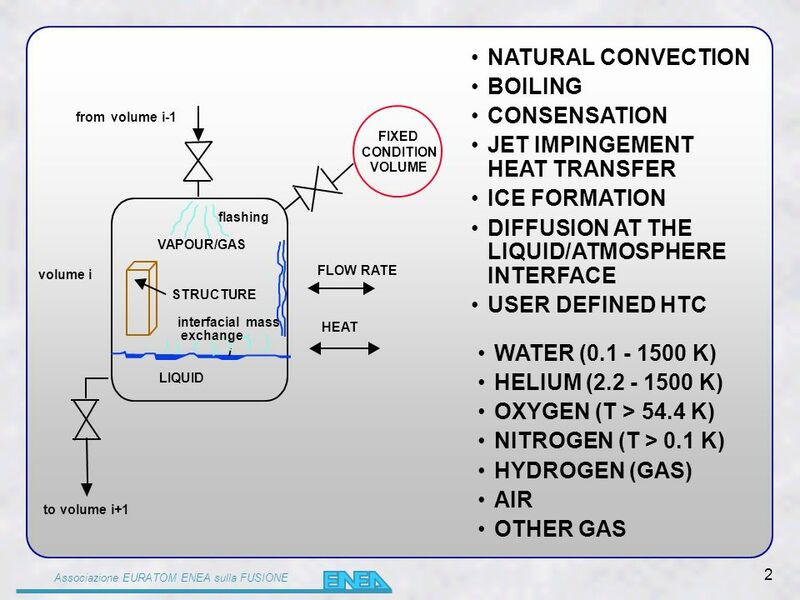 In CONSEN all the tritium is considered in HTO form diluted in the steam and in the atmosphere. It is treated,at the present, as a gas (it does not condense on cold surfaces). 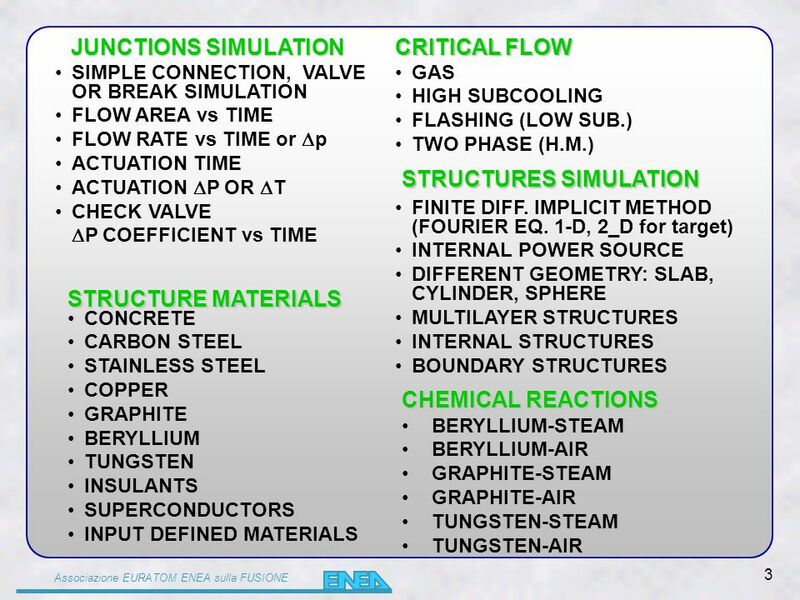 Download ppt "Associazione EURATOM ENEA sulla FUSIONE CONSEN A COMPUTER PROGRAM FOR TRANSIENT SIMULATION OF ENERGY AND MASS TRANSFER BETWEEN INTERCONNECTED VOLUMES DEVELOPED." Heat Loss Calculator for a Stainless Steel Complex Pipe System By: Thomas Morris & Jacob Hannon. Heat Transfer Review D. H. Willits Biological and Agricultural Engineering North Carolina State University. D 2 Law For Liquid Droplet Vaporization References: Combustion and Mass Transfer, by D.B. Spalding (1979, Pergamon Press). “Recent advances in droplet. INRNE-BAS MELCOR Pre -Test Calculation of Boil-off test at Quench facility 11th International QUENCH Workshop Forschungszentrum Karlsruhe (FZK), October. Numerical modeling example A simple s teel reheat furnace model – pg Reheat furnace Hot steel slabRolling mill Final product. HEAT EXCHANGERS in food process engineering Energy balance methodology used to design industrial equipments 1 FIP-DES Bertrand Broyart, Violaine Athès. Kick off meeting EFDA Task TW6-TSS-SEA2.1 Garching 10th/10/2006 ENEA Engineering approach of the potential accident scenario leading to the worst release. Change of state. Change of state and energy consumption. GOTHIC: Overview TL George Numerical Applications, Inc.